Will my car pass the NCT? In Ireland, every car over 4 years old requires a roadworthiness certificate, which it gets by passing the National Car Test (NCT). If you're buying a used car, it's important to know how likely that make and model is to pass the NCT - and if it fails, on what part of the test. Idiro has created a simple NCT car checker tool, available online. You’ll find it at www.Idiro.com/NCTchecker. Just enter the make, model and year of the car in question to learn all about how these cars perform in the NCT. If your car is quite rare, like the Mazda MX-5, then we recommend that you select all the years of NCT tests. Otherwise, just leave 2017 ticked. 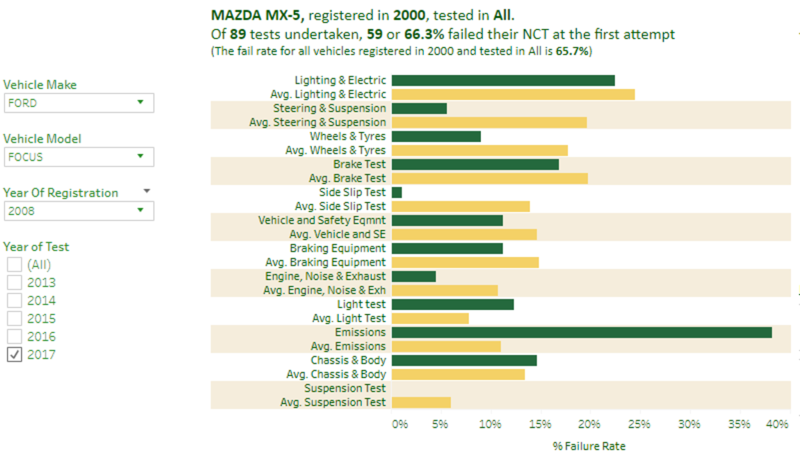 As you can see, Mazda MX-5s from the year 2000 have a 66.3% failure rate across 5 years of tests - just slightly worse than the average of 65.7% for all cars of that age. However, look at the detail - the MX-5 does much better than average for some elements (no failures for suspension!) but much worse for others (four times worse for emissions). That will help you know what to look for when buying a used car, and help you prepare your car to maximise its chance of passing the NCT. Our handy NCT checker works on phones, tablets and PCs. Kudos to my colleague John Grant for building it. For people who would like to dig deeper into the NCT results, we have produced an interactive dashboard as a demonstration of our data analytics skills. Again, it uses data published by the Road Safety Authority covering 2017 NCT tests. Data has not been published on retests, so our dashboard covers the first NCT test that each car underwent in 2017. For practical purposes, the data is filtered to show only the twenty most popular makes of vehicle tested in 2017, and for each of these, only models with at least 1000 tests in the year. This was necessary because to show every make and model of car tested would make the dashboard so complex as to be unusable. As a result, from the total 1.4 million tests carried out in 2016, 1.1 million tests are represented in this dashboard. However, if you do want to look at makes and models of cars that are not shown in this analysis, you can download the full dataset from the RSA. Pro tip: To reset all your filters and return to the original screen, click your browser’s refresh button. The RSA provides the ‘Year of Car’ of each car tested, which we understand to mean the year of first registration. You can filter by the age of cars using this slider. For example, if you want to see test results for all cars registered in 2010 or before, you simply drag the end buttons in the slider over to the desired year. This is an interactive dashboard, so as you change one parameter, all of the graphs adjust to match your selection. 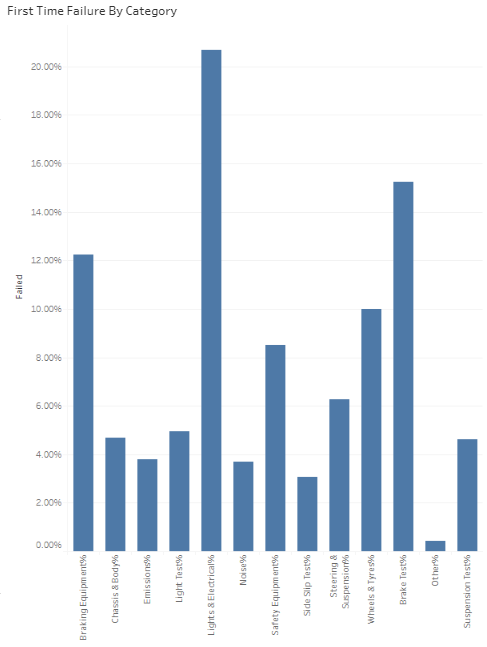 For example, this bubble table shows the top 20 most popular makes of car with a 2010 or older registration. The bubble's size indicates how popular that make is, and its colour indicates the make's pass rate - from deep blue (high pass rate) to deep red (low pass rate). In this example, we can see below that for vehicles registered in 2010 and older, Toyota is the most popular make and has a high pass rate. Now let's click on 'Toyota'. As you can see, this changes all the charts in the dashboard - they now only show the details of Toyota models. Pro tip: To compare different car makes, hold down the CTRL key while you click on each make that you want to filter in the bubble chart “Overall Popularity & Passing % of Model”. Now let's examine the different Toyota models. 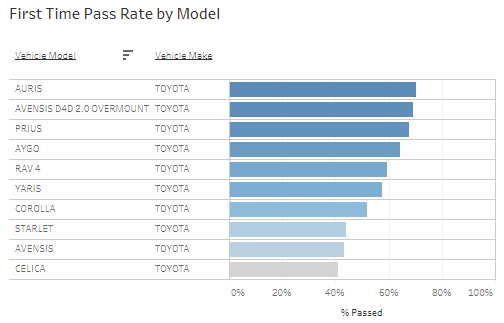 In the next graphic to the right, ‘First time pass rate by model’, you’ll see the pass rate of each Toyota model. In the table on the far right entitled ‘Most Popular Model & Age’, you’ll see each model in the Toyota range. The Prius is the Toyota with the highest pass rate, but it isn’t the most popular Toyota - as you can see, the Corolla is the most popular (as you will see, Corollas have been around since 1980). 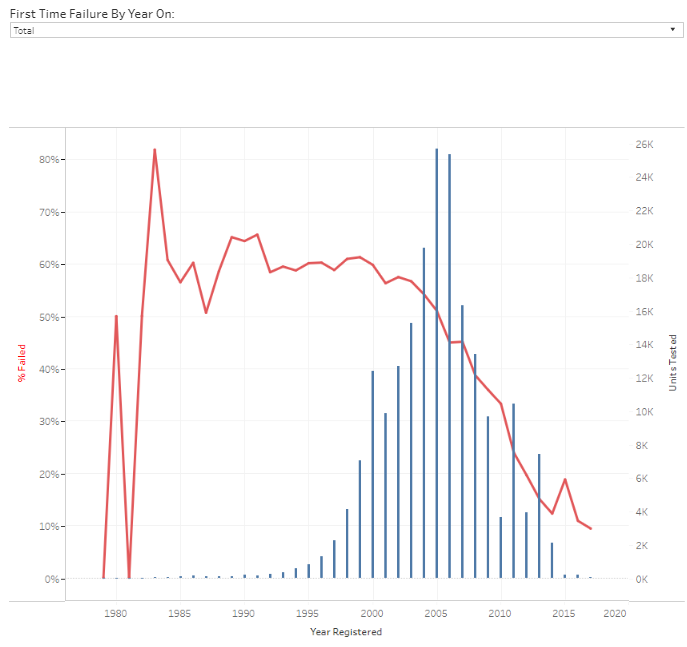 As you scroll down, you can see the ‘First Time Failure By Year’ graph which shows the number of cars tested (blue bars) and failure rates (red line) for each year of registration. As you can see, younger cars are much more likely to pass the NCT. To look at failure rates over time in each category within the test, you can filter by category in the drop-down menu. To the right you'll see the ‘First Time Failure By Category’ table, which shows the percentage of cars that fail each category within the NCT test. This image displays what caused Toyota cars to fail their NCT. This dashboard works best on PCs, rather than mobiles. Kudos to colleagues Paul Goldsberry and John Grant for building it. We do hope you find these tools useful. To discuss how Idiro's analytics skills can help your business, drop us an email at info@idiro.com. To download the source data from RSA.ie, click here. Today Idiro has published a data visualisation dashboard (here) allowing you to explore the 2016 NCT test results. This interactive report is published by Idiro Analytics as a demonstration of our data visualisation capability. The data used is published by RSA.ie and covers NCT tests conducted in 2016. The data covers the first NCT test that each car underwent in 2016 - data has not been published on retests for cars that fail. The data is filtered to show only the twenty most popular makes of vehicle tested in 2016, and for each of these, only models with at least 1000 tests carried out. This was necessary because to show every make and model of car tested would make the dashboard unusable. As a result, from the total 1.4 million test carried out in 2016, 1.1 million tests are represented in this dashboard. If you wish to examine the data further or want to look at makes / models of cars that are not shown in this analysis, the full dataset is available for download at RSA.ie. 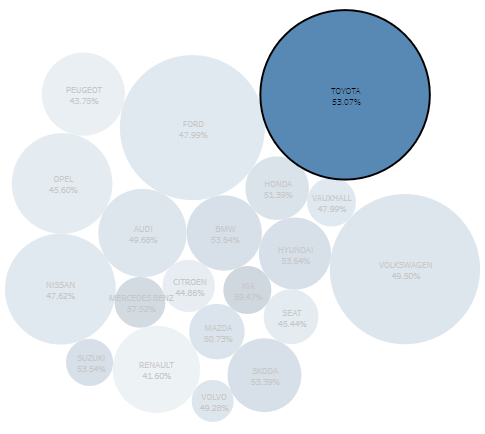 Pro tip: To compare different car brands, press CTRL + click on the type of makes you want to filter in the bubble chart “Overall Popularity & Passing % of Model”. The RSA provides the ‘Year of Car’ of each car tested. You can filter by the age of cars using this slider. If you want to see cars from 2010 or before that were tested in 2016, you simply drag the end buttons in the slider (at the top) over to the desired year. As the year changes, so do the interactive maps. 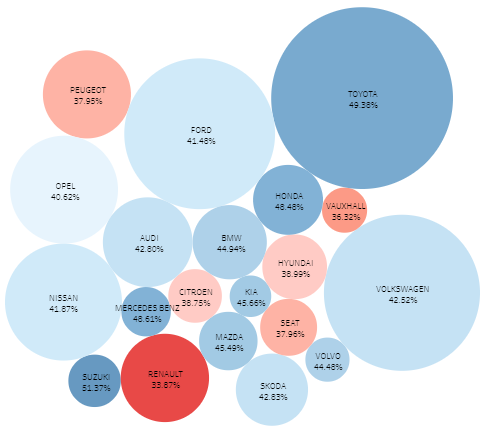 This bubble table shows the top 20 most popular car models with a 2010 or older registration tested in 2016 that passed first time. The bubbles indicate how popular that model is, and the colour of each circle indicates the pass rate - from deep blue (high pass rate) to deep red (low pass rate). For example, we can see below that for vehicles registered in 2010 and older. Toyota is the most popular and has a high pass rate in 2016. In the next graphic to the right, ‘First time pass rate by model’, you’ll see the different Toyota models that were tested. In the next table ‘Model Popular Model & Age’, you’ll see the most popular models in the Toyota age range of the models tested. Although the Prius has the highest pass rate in the Toyota model, it isn’t the most popular make, Corolla is the most popular. As you scroll down the interactive map, you can see the failure rates of each car that was tested in the NCT and what the cause of the failure was. You can filter what cars failed on by category or you can choose to see total which will show all the categories on the ‘First Time Failure By Year On’ drop-down menu. The image below displays blue bars which indicate the units tested in each year and the red line graph shows the failure percentage rate. Remember that pass/fail thresholds can vary according to the age of the car. As you scroll across, you’ll see the ‘First Time Failure By Category’ table. This table shows each category that the NCT test each car. This graph displays what caused Toyota cars to fail their NCT. To contact Idiro about this blog post or about how Idiro's analytics can help your business, drop us an email at info@idiro.com. To download the source data from RSA.ie, click here.